On the evening of April 17, I was waiting for the train like always, far enough away from the edge—standing sideways to brace myself from that wildebeest who might push me onto the tracks. I waited and looked for the train to arrive, as if staring would make it come faster. It never works. We all do it. Like pressing the elevator button over and over and over, hoping that the vertical transport machine hasn’t finally chosen to forget about us. It was then that the tall, blonde man (from what I can remember), dressed in black, sprinted across the subway platform and leapt high in front of the train that struck him with brutal force. It was an Olympian effort. But it’s that dense sound that’ll probably never leave me. It was a mash-up. Two raging animals coming head-to-head in a fight to the death. Man and machine. The train screeched to a halt. It’s not that I saw his blood. No remnants or pieces. I didn’t even see the man go under. A woman with a baby in a stroller sat on a bench and began weeping. I wasn’t afraid. I wasn’t sad or traumatized. My heart began to race. I was finally and completely “here.” I paced for a few moments. I felt alive again. “Call someone,” I told the candy and newspaper vendor seated in one of those metal encasements so emblematic of this city. He grabbed his cellphone. “Yeah, some guy just jumped in front of a train,” he said in a nonchalant, slightly accented voice. Maybe he had seen this before. Maybe this was his way of coping. Or, perhaps he simply didn’t care. I walked toward the front of the train and peeked in between the train and platform edge. I couldn’t see anything. Couldn’t see pieces of the man, I should say. Why I did that, I certainly hate to admit here. There’s no way he could’ve survived that impact. A guy with a baseball cap and the most sullen of faces stood in front of the train, looking into the conductor’s window, and glanced at me. Were we there for the same reason? Appeasing our racing hearts? I suspect he saw “the somethings” I had been seeking to experience. I decided to turn around and walk the other way. Another guy was trying to pry open the train’s doors to let passengers free. They were trapped like we all were trapped. Every workday during subway rides, there’s something: young boys rap and perform acrobatic moves on train poles for a couple of bucks. Drug-addled panhandlers tell sad stories. One guy was completely wrapped in aluminum, strutting through the subway car like some tin-foil lunatic. Another man (whom I still see from time to time) has no legs, and pushes himself with his massive arms while sitting on a carpeted board with wheels—his coffee can filled with dollar bills and coins jangling as the train sways to and fro. In the week that followed, I told a few people about what I had seen. I scoured the internet, but the incident wasn’t covered anywhere. 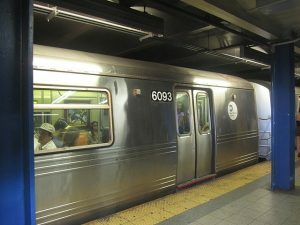 The subway’s official Twitter feed only stated, “a man had been struck by a train.” I appealed for details, but received no response. The people I told about it looked at me as if I was insane. Like I’m the type of guy that says, “My grandma has cancer,” to elicit pity because I don’t have the ability to summon empathy. Nonetheless, I enjoyed telling them—the shock on their faces. “I saw a man get crumpled by a train.” The metal, big game of our urban wilderness pulverized its human prey. No one offered me a trophy. But the look on their faces. They’ll probably never hear that dense sound at any time during their plop-along lives. I finally called the local police precinct and, after leaving a message with the cop who answered the phone, received a call back from a detective. I just wanted confirmation that what I saw wasn’t completely fabricated in my head. “Tell me what you saw,” he said. I described it to him. “That’s pretty much what everyone else described. We notified his family,” he told me. And that was the extent of it. However, he did ask, “Why did you wait until now to call? It’s been more than a week.” What I wanted to say was, “What would be the point? What could I offer that wasn’t already evident in simplest, pulp-and-bloody form? “I figured you had enough witnesses,” I replied. And I think I muttered, “I’m not sure why I waited.” Everything was confirmed. No one has ever asked me about it since. I’ve come to terms about an essential truth: my days have, once again, transformed from mundanity to unpredictable periods of adrenaline. I have people in my life whom I love with all my heart, and who love me, too. But there are those anonymous persons among us who function best under the threat of the sword, or by bearing witness to the unwatchable. You look around, but you’d never be able to sniff them out. Someone must bear witness. I feel like this is my truest purpose and burden. So, when you pass from this world to the next, you can count on me to be there. Leland Pitts-Gonzalez is the author of The Blood Poetry (novel) and Savage Anesthesia (short stories).